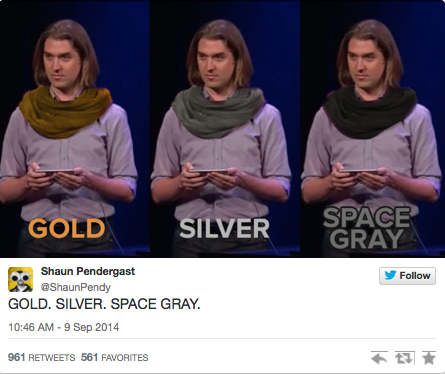 Just like the iPhone 5s, the iPhone 6 Plus is available in three different colors: Silver, Gold, and Space Gray. Of course we went for the Gold. The iPhone 6 Plus is identified by its model number: A1524. Much to the distress of some reviewers, both iPhone 6 models feature a noticable camera "bump". It seems that Apple was unable to shave enough thickness off of the camera sensor to keep it flush with the rest of the chassis. The lens cover may be made out of sapphire glass, but we're still concerned about what this design choice might mean for durability. Much like the HTC One M8, the iPhone 6 Plus features two plastic antenna stripes on the outer case. These stripes help with wireless reception that would otherwise be blocked by an all-metal outer case.